[donotprint] I know its not summer yet but I don’t care. We’re making homemade kettle corn at our house and its the perfect salty-sweet snack on a beautiful day like today. Several months ago I posted a caramel corn recipe (Crackerjack) and a company called JustPoppin.com left me a comment. Out of sheer curiosity I replied via email with a very simple question. “How come my popcorn doesn’t have huge balloon type qualities like the kettle corn I get at the fair?” I was told the variety of popcorn they use at the fair are called “mushroom” kernels. I had always believed the way to get those huge kernels was the kettle cooking method and was happy to learn I could buy the same mushroom kernels to make kettle corn at home! Truth be told, I love the balloon type variety of kettle corn and was excited to learn the secret behind my misconception. 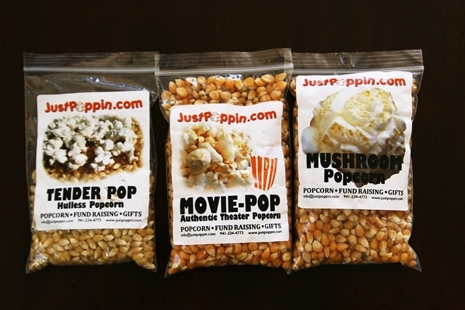 The folks at JustPoppin were kind enough to send me a few small samples of different types of popcorn (tender pop, movie pop, and mushroom popcorn) to play around with. 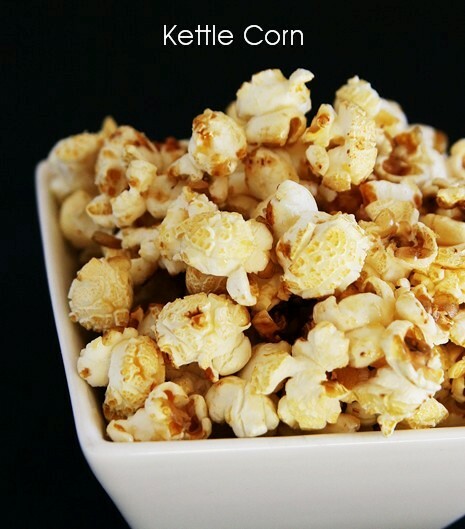 All I can say is this… Kettle corn made with mushroom popcorn is d’bomb. <— I realize no one says d’bomb anymore but once again, I don’t care. They are d’bomb. Heat oil in a large pot over medium-high heat. Add popcorn and sugar giving it a quick stir and then cover with lid. Once popcorn starts popping, pick it up and give it a quick shake every few seconds until popping slows down, between 3-4 minutes. Remove immediately from heat and pour into a large bowl. Sprinkle with salt and serve immediately. Do not make the mistake of removing the pot from heat without transferring to a bowl. 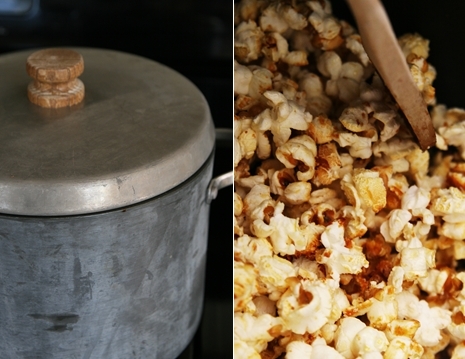 Due to the high heat of the pot, if you don’t transfer the popcorn it will caramelize and perhaps burn. *Also, do not attempt to make a batch of this in a dutch oven. I made a second batch thinking it would work and it caramelized to quickly and burned. 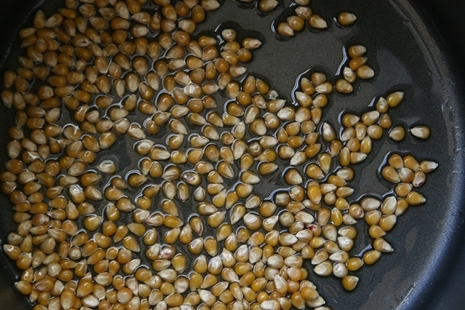 3 kernels of corn should be added to the oil in the pan at the very start. Only after those kernels pop should the rest of the corn and other ingredients be added to the hot oil. 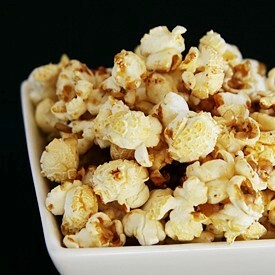 Do this instead of adding the popcorn to cold oil and heating it together (which saps the popcorn of needed moisture). 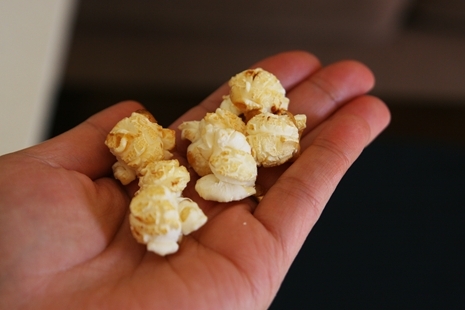 More so than any other popcorn, Mushroom Popcorn kernels are very heat sensitive. They need higher heat (over 400F) to pop with the explosiveness necessary to get that big puffy ball shape, and to get it from the overwhelming majority of the kernels in the pan (which should be the result). If you have more questions about popcorn he says you can pop (get it? pop?.. never mind) on over to Justpoppin for more tips. PS: If you are fanatical about this type of kernel like I am, you can order them online at justpoppin.com since grocery stores do not carry this type of kernel. Just so you know – Disclaimer: JustPoppin.com did not sponsor this post. They merely provided me with a few samples because I was curious about mushroom kernels. 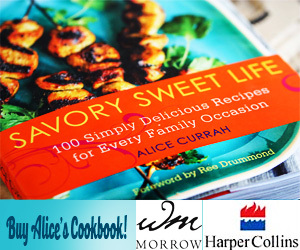 sugar is white sugar or could brown sugar work or better yet low glycemic coconut brown sugar? Just read your recipe and going to order the mushroom popcorn kernels then try the recipe.